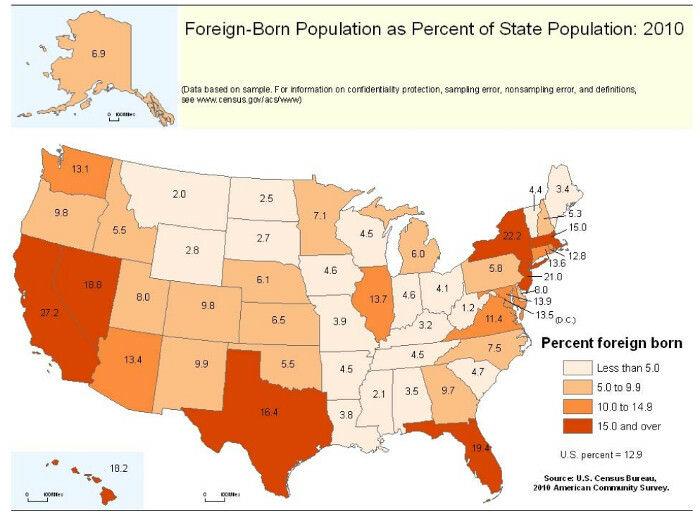 The foreign born population of the United States is at near record levels of over 14 percent, as of 2018. The last time this happened, the U.S. shut down immigration for 40 years and assimilated the immigrants. It is less clear that will happen this time. The big wave of immigration ending about 1920, was part of how Progressivism took over as the dominant ideology in the United States. The current wave of immigration, began in 1965, is part of how Progressivism is pushing out the remnants of Constitutional ideology today. President Donald Trump is part of a desperate attempt to stop the slide to unlimited government in the United States. It will not be successful unless the United States severely limits immigration and starts teaching Constitutionalism and limited government in its schools. High immigrant populations are not absolute indicators of dominance by leftists, but there is clear correlation. Well, those that they know of. It is where the immigrants come from that matters, as well as raw numbers. Had the US allowed everyone from Eastern Europe who wanted to come here do so since 1991, and shut the immigration from South of the border, Trump would be heading for a 49-state relection win on the order of Reagan in ‘84. OTOH, immigrants coming from cultures that do not value education, that come from the bottom half of the world IQ scale, and who have been weaned to believe that “da gubmint” owes them a living are the problem. The real question is: why at this juncture in history does ANYONE think the United States needed re-settling? Go back to 1969 when the entire chattering class and the government was hysterical about Overpopulation, telling Americans to have only “replacement” children and using this excuse for allowing abortion! Were we really overpopulated? If not, why are the same people who screamed that then now say we need tens of millions of people who had nothing to do with our Revolution, the subsequent settlement of the entire country, all the wars fought to maintain what was won in 1787? We “needed” 60 million “immigrants” who have no ethnic, genetic or linguistic relation to us? In fact, in the case of Mexico, they actually believe our territory is not ours, and that we have no right to nationhood, and that the wrong side won the War in 1848? Note the idiot Erlich still can’t admit he was wrong. Americans used to have 4 and 5 kids per family. If the Baby Boomers had done that there would be zero credibility to the claim that “we need immigrants”. The population would what it is now but probably 70% would be descended from the original settlers who came before 1770, which is what it was in the ‘50s. Does anyone think all those men in all the wars fought so that California could become majority Mexican, up from 4% of the population in 1970? What has happened in the last 40 years has only one precedent in history: the invasion and fall of the Roman Empire. Those numbers are way off—Too low. Double them. Someone needs to hang from a lamppost, ben. That was the goal, the Lyndon Johnson goal, and it appears to be nearing a full achievement. I'm hopeful we can end this immoral push but I will tell you that I am not confident. "High immigrant populations are not absolute indicators of dominance by leftists, but there is clear correlation"
OK... But, there is, absolutely, clear indicators of a correlation? When the USA collapses, it will take down the rest of the world with it. We are headed for a hundred years dark age, just like the thousand year dark age of Muslims. There will be no middle class, only the government nobility and the pheasants. Just like the Soviet Union, where everyone pretended to be equal while they slowly starved. OTOH, immigrants coming from cultures that do not value education, that come from the bottom half of the world IQ scale, and who have been weaned to believe that da gubmint owes them a living are the problem. As an example immigrants from India mostly vote democrat. Yet the same group of immigrants have the highest income, highest net worth and highest education level of any other ethnic group in USA, including ethnic Jews, ethic Chinese & Japanese, US born citizens, European immigrants etc. Therefore I submit the real reason democrats win over immigrants is they portray a false aura of inclusiveness much more than republicans. As the immigrants get older and wiser, only then they begin transiting towards republicans. Actually it is because infrastructure needs to be in place to support those immgrants and thats a fact given 2 out of 3 immigrant families get govt help and subsidies, and democrats control urban cespool cities which cater to supplying these services and funds. Roughly 40 million illegal immigrants to replace the roughly 40 million kids we aborted. As an example immigrants from India mostly vote democrat. The education and society in India are far left, nearly Communist. Started with Clinton, continued with Bush, more and accelerated with Obama. "Started with Clinton, continued with Bush, more and accelerated with Obama." God’s wrath? Or just the obvious result of an insane nation? This was almost ten years ago. It is a lot different now.